I’m not one for business books, and this is explicitly a business book. The closest I’ve come to one, in the last decade, was Joseph Finder’s corporate espionage thriller Paranoia. 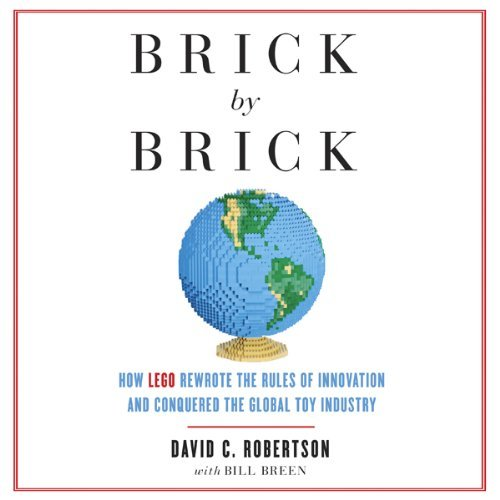 On the other hand, I really am one for LEGO and Brick By Brick: How LEGO Rewrote The Rules Of Innovation And Conquered The Global Toy Industry is an audiobook about The LEGO Group. 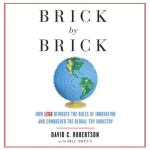 Most of the book is about the recent history of LEGO, how it became unprofitable, and how it, through controlled innovation, recovered from that unprofitably. Along the way there is a fair amount about the company’s history – and even more importantly about the philosophy behind the “system” of The LEGO Group’s core product, the LEGO bricks themselves. I started with LEGO in the mid-1970s, and barring a few pieces (lost, vacuumed, and stolen) along the way I still have much of it. But, similar to many other AFOLs (adult fans of LEGO) I experienced a decline in interest in LEGO as I entered my teens. As a kid I appreciated that LEGO allowed you to build your own toys, as a tween I programmed my own robotic LEGO creations (LEGO LOGO for Apple II) – but shortly thereafter the corporation seemed somehow go off track – creating products that were less LEGO sytem than LEGO branded toys. That is until around the mid-1990s. And that’s about when my re-invigoration of interest in LEGO started. No coincidence there, as this was also about the same time as the company’s financial revival. It seemed that the more I got more into LEGO the more the company became financially viable – but, of course, it was actually the reverse. Indeed, Brick By Brick is essentially Robertson and Breen trying to figure out how the company works, where it went wrong, and how it recovered. In doing this they have looked at a number of failed projects, how they came to fail, how the company reorganized itself and how, with help from both adult LEGO fans and child LEGO fans they learned to operate without patent protection. One of the more interesting comparisons between companies that Robertson and Breen make is that of LEGO to Apple. The parallels between the companies’ aesthetic philosophies (and cult like devotion by their customers) are many. I myself am a committed Apple iPhone user, not because I buy into the ecosystem, but rather because of the sculptured discipline of the technology. Likewise, though Megablocks and other LEGO competitors are making bricks that are 100% compatible with (and cheaper) than LEGO I am scrupulously careful to weed out MEGABLOCKS and other “fake lego” from my collection. The iPhone’s competitors aren’t really competitors, and the LEGO system’s competitors aren’t really competitors. Back to the book, David Robertson and Bill Breen talk about a number of LEGO lines that I like, particularly the CITY, SPACE, and CASTLE lines but they also explain the thinking behind popular licensed IPs like STAR WARS, INDIANA JONES, and THE LORD OF THE RINGS. Several chapters cover the creation of the successful BIONCLE line (originally conceived as a line called “VOODOO HEADS”), the innovative board game division (that sneakily gets moms to buy more LEGO), and the massively expensive failure of the LEGO UNIVERSE project (an ambitious project aimed at disrupting LEGO’s own core market). And that last one is one of the most fascinating sections of Brick By Brick. By trying to make the experience perfect, by trying to produce a graphically rich massively multiplayer online game without bugs, then charging a whopping $40 to start playing it LEGO screwed up royally. The failure of the LEGO Universe project is all the more ironic in that a lone computer game programmer, Markus “Notch” Persson, came to create a sucessful kind of digital competitor to LEGO system, in the form of Minecraft. Peterson’s success, using almost no resources and no money, make the error of LEGO hierarchy all the clearer. But in an even more ironic move LEGO has since produced a Minecraft set! In my view the only thing missing from Brick By Brick is talk about the very successful, collectible Minifigures line (now up to Series 10). To my ears Minifigs get very short shrift in Brick By Brick. I’d love to hear a two or three hour audiobook about that alone. There’s very little to say about narrator. Thomas Vincent Kelly is a relatively new narrator, his reading is clear and precise, like the LEGO system. The occasional Danish place-name pronunciation, and the names of the LEGO products themselves are the only real narrative challenges. Kelly delivers. David Robertson: The Story of LEGO from BrightSightGroup on Vimeo. Great review. I meant to tell you I got the librarian mini figure for my birthday!